DENVER, Colo. (Embargoed until 2 P.M. MT, Wednesday, June 14, 2017) – In the battle against metastatic prostate cancer, the removal of lymph node metastases using image-guided surgery may have a high clinical impact on outcomes. Researchers at the 2017 Annual Meeting of the Society of Nuclear Medicine and Molecular Imaging (SNMMI) demonstrated preclinically that dual-labeled PSMA-inhibitors based on PSMA-11 enhance preoperative staging, using PET/CT followed by fluorescence-guided surgery. The combined approach results in more accurate detection of PSMA-positive tumor lesions. Each year, SNMMI chooses an image that exemplifies the most promising advances in the field of nuclear medicine and molecular imaging. The state-of-the-art technologies captured in these images demonstrate the capacity to improve patient care by detecting disease, aiding diagnosis, improving clinical confidence and providing a means of selecting appropriate treatments. This year, the SNMMI Image of the Year was chosen from more than 2,000 abstracts submitted to the meeting and voted on by reviewers and the society leadership. The 2017 Image of the Year goes to a team of researchers from the German Cancer Research Center (DKFZ) and University Hospital in Heidelberg. The image clearly demonstrates how combining the advantages of 68Ga-PSMA PET and intraoperative gamma and fluorescence imaging results in better tumor identification before and during surgery. IMAGE OF THE YEAR: Dual-labeled PSMA-inhibitors for the diagnosis and therapy of prostate cancer. 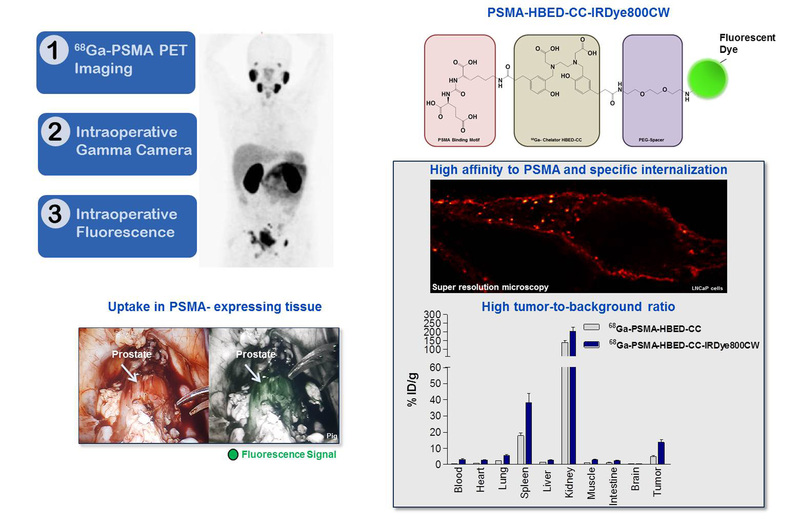 Technology of dual-labeled PSMA-inhibitors for PET/CT imaging and fluorescence-guided intraoperative identification of metastases. This work might help to establish a new treatment regimen for more precise and sensitive pre-, intra- and post-therapeutic detection of prostate cancer. Credit: Courtesy of A. Baranski, M. Schäfer, U. Bauder-Wüst, M. Roscher, J. Schmidt, E. Stenau, L. Maier-Hein, M. Eder, K. Kopka, German Cancer Research Center, Heidelberg, Germany; T. Simpfendörfer, B. Hadaschik, U. Haberkorn, Heidelberg University Hospital, Heidelberg, Germany; PET-image: Afshar-Oromieh et al., EJNMMI 2013; 40(4); STED-image: J. Matthias, German Cancer Research Center.